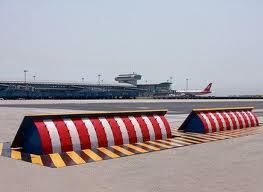 Our High Security Road Blockers are designed for use in high security high traffic applications. The Road Blocker are easy to install and provides highly secure vehicle access control system for approach entrances to banks, military installations, airports, docks, embassies, and government offices etc. 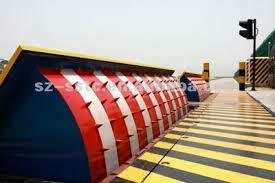 The Road Blocker retracts below ground providing safe access for authorized vehicles. When the vehicle passes, the Road Blocker returns to the active position ensuring total protection from unauthorized vehicle within 6 second. The blocking and the housing element of the Road Blocker system are designed in heavy steel profile construction with welded sections to absorb impact loads up to 1200kN. The blocking element with the integrated anti-deflection device is electro hydraulically operated with an electric motor of (230/400 V, 50/60 Hz, 3-phase). Electro/Hydraulic Road Blocker comes with push- button control as standard, however it can be customized to interface with a wide range of access control equipment to suit specific customer requirements and can be configured to use with Inductive loop systems, cardreaders, biometric access control and manned guard post. Also panic systems can be accommodated. We strongly recommend the fitting of a recordable CCTV system, traffic lights, safety systems and backup power system..
• Designed for Heavy Load Traffic up to 10 ton per axial. • Manual Hand Pumping operation facility in the event of power failure. • Easy to Install due to box type design. • Absorb impact loads up to 1200 kN. • Substantial up to 800mm raise height. • Maximum Length up to 4 meter per unit. • Road Blockers Standard Speed of Operation: 6-8 Seconds. • Total weight 1800 to 3000 Kg (depending on size & type). • Emergency Fast Raise System. • Emergency buttons with lock down. • UPS backup for the electrical system. • Traffic Lights and Back Indications Systems. Construction: The framework is constructed from fully welded, heavy gauge, steel angle and box section and hi-tensile structural steel. • Cold rolled steel shall conform to ASTM A1008 and A568. • Hot rolled, pickled and oiled steel shall comply with ASTM A1011 and A568. • Hot dipped zinc coated steel shall be of the alloyed type and comply with ASTM A924 and A653. • Steel Sheet, Electrolytic Zinc-Coated shall conform to ASTM A591. 4. Maximum load per axil. 5. Any options / additional features required.